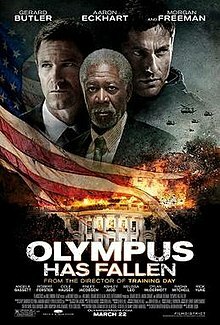 I'm not sure exactly what enticed me to watch Olympus Has Fallen, the movie about a terrorist attack on the White House (not to be confused with a similar movie, White House Down). But I put it on my Netflix queue and it bubbled to the top (well, being a new release, I put it at the top). I have to say, I enjoyed the movie. For a movie dealing with the President it wasn't overtly political (it did stray into Hollywood pabulum occasionally) and it was fun and exciting and people who didn't serve in the military probably didn't notice a bunch of stuff that wasn't very realistic. I did find it interesting that Morgan Freeman was cast as the Speaker of the House and a politician to the right of the President, at least on foreign policy. Basically we have a bloody and violent popcorn movie. But it suffers a flaw (not exactly fatal in this case) that a lot of thriller movies (and books) have. That is, the climax (at the end of the movie) is not as exciting as the first act battle sequence that sets up the story. The taking down of the White House was a very well executed and exciting sequence early in the movie (if unrealistic, I thought). The climax (with a ticking clock, no less) was less so. But if you park your brain and enjoy the ride, it's a fairly fun film. The worst part was watching Lawrence O'Donnell try to act.